I don’t generally suggest SC cards as their reward rates are pretty low than any other cards. However, Standard Chartered Super Value Titanium Credit Card is known mainly for its Fuel cashback benefit which is the whole reason for this article. Its one of the rare Fuel cashback cards around along with other benefits. I calculated the reward point value by finding the value of one of the products in points redemption. They keep changing the point value from time to time (usually reduce). In this range, you can also consider ICICI Coral credit card (mastercard version) which also comes with MasterCard domestic Lounge access and 0.5% value back as Payback points. In response to Standard Chartered, HDFC recently launched two cards as below with similar benefits. 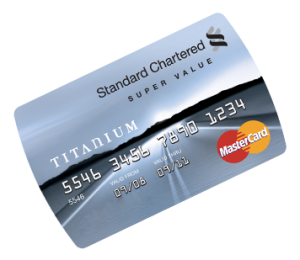 Whats your thoughts on Standard Chartered Super Value Titanium Credit Card? Feel free to share your experiences below. I have their Landmark credit card (earlier known as innercircle credit card) , its free for life and has mastercard airport lounge access. The points value has been devalued now. Earlier it used to give 1.2% value back now it gives 0.6%. Thanks for sharing your experience Prashant! Sorry i have VISA card and have used to access lounges. Yes, its one of the nice cards to have as well. Hey Siddharth, I would like to differ on this one. I own this card and I usually end up getting monthly 500 cash back without much effort. I feel it’s a wonderful card. While the earn rate maybe low. It’s cashback feature for bill payment allows you to get 5% back almost every time! Would you agree that from the perspective of utility bill payment (mobile / gas / electricity) this is the best card? Sounds good. Sure, i agree, it does help for Utility Payments and this being an inbuilt feature of a card is a nice thing indeed. Usually u get cash back on Paytm FreeCharge…..and then the premium cards have good reward rate…..so the card is useless…. Hold it as long as its for free! Shouldn’t it be other way round? Fuel – 2.5% and Mobile – 5%? I suggest you dump this card, as Infinia has inbuilt 3.3% reward rate in the form of reward points and as suggested in an earlier comment if you route your infinia spend via paytm/freecharge for mobile bill payment, you also get discounts. Hence, get this card revoked. I’m sure it is not free as 60k need to be spent in the year for waiver. p.s: When loading on paytm, cashback is not guranteed. Don’t know why but I used to get it randomly. But there have been instances of me using 5th transaction in freecharge and getting 5%. i still feel this card is worth it. thanks for the info i have Super Value Titanium which is lifetime free… haven’t been using it much..now can be used to buy fuel via wallet overall 5% saving instead of 2.5 in normal case. How you got it ltf.. Any Leeds would help..
Are you sure about the lounge access? Update: Received message from SC that lounge access feature on Landmark rewards credit card is being discontinued w.e.f.01 May 2017. Now they changed the reward point structure. I got a mail that they are offering me a upgrade from Super Value Titanium to manhattan credit card. Whats your view , should i go for it ? Overall max per month is 500rupees cashback ! Hello there, i have been following your blog for quite some time now. You are really a big helping hand.. Keep up the good work. Nevertheless people need to be given credit here as well as their comments also reveal a lot of information. That being said. I want this card life time free. I also got an offer regarding the same via 3rd party executive but i dont trust them a lot. I approached the bank and they told me there is no way this card can be provided to a customer ltf without having a salary account with them. Is it true. Does anybody have this card ltf without holding a SCB salary account? And is it worth having the given conditions of 30000rs to waive off joining fees and 60000rs for renewal fees. Is there any other card which provides 5% cashback at every petrol pump? Hello Friends, I am holding this card from last 3 years, and use it for fuel only and feel it is best card for this purpose. The reason i don’t use it for any other purpose is, it don’t get much benefits for other purchases and another bigger reason is, from last 3 years only its limit is 20K, inspite of all bills paid on time. My current monthly in hand salary is around 1,25,000. Holding HDFC Bank Card from past 6 Years with limit 2.80 L. After requesting many times and sending my salary slips, SC is not increasing the limit. Do you guys think may be i primarily use it for fuel only and not spending on anything else could be its reason? That doesn’t seem to be a reason. because one of my friend too stuck with 20k limit inspite of spending 2L+ and holding for more than 2 yrs. That is strange. I don’t use my SCB CC much. But, every six months I get to increase my credit limit by calling customer care without submitting any pay slips. Try calling the customer care and ask if you are eligible for limit enhancement. As per my discussion with SC bank guy, he said card is given to anyone with more than Rs.25000 in-hand salary. But, I am joint applicant to one home loan of EMI Rs.53000 and my in-hand salary is Rs. 28500. My doubt was that will I get the Card as EMI is higher than my salary? Or I won’t face any issues as such? Kindly let me know as I want to apply for this card, and don’t want to affect my CIBIL score in case they reject my application. Has 10% cashback, which maybe good for domestic flights. 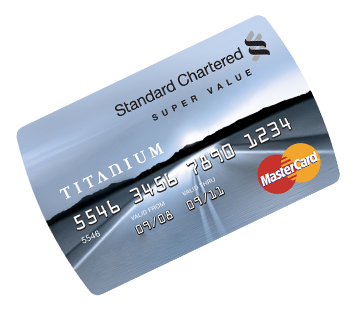 I had always appreciated Standard Chartered for their banking services but this new super value Titanium card was a bad choice. The card I received is a standard Box type one. When contacted Customer service through phone, they were sure that I have been provided curved shaped card but their email team replied that they are not offering curved shape cards anymore. I am just going to pay the joining fee and cancel the card. Enough of SC in my finances. how is it in comparison with this StanC card? I hv received this card recently for a life time free offer. I already using HDFC Regalia First Card for all daily transactions. Request you to suggest me between these two cards for the spent. means in which card should I get the maximum Cashback & by where using it. Received a complimentary Priority Pass card with the SCB Titanium credit card today. No mention of it any where on their website. And did they mention anything about complimentary visits too? Yes.It’s spend based. spend 10000 in the previous month and get one complimentary visit in the next month. Correction. Spend 10000/- this month and get one complimentary visit in the next month. Checked with the customer care now. It is a premium variant of the same card issued to a few customers. so they haven’t mentioned it on their website. They say we can use the priority pass at both domestic and international lounges, provided we fulfill the spend criteria. No separate complimentary domestic lounge access as such. Do check the card name in internet banking. It should be Premium Super Value Titanium instead is Super Value Titanium. They do issue priority pass with premium version. My wife got it and this card is LTF for her. Yes. It is indeed Premium Super Value Titanium. I did not know that it even existed. Then do expect an 1000 Amazon voucher too in next 60 days. How did you get the Amazon voucher, by post (physical) or email/sms (evoucher)? Also, do you think it might be spend based? How much did you spend from your card within first 15 days or 30 days? Recently when annual fee of Rs. 750+GST was applied, I called StanC customer care, for reversal of annual fee, as my spends were to tune of Rs. 3L in preceding year. To my surprise the first time when i called for it, it was rejected. I again called and have to request for same. The customer care guy acknowledged that my spends are huge but said 60k is not the amount on which fee will be reversed henceforth. Upon my asking he said it should be more than 3L then company would decide. I was bewildered. I said it was always reversed in last 6 years for me and the amount told to me for fee reversal is 60k only. As i was not satisfied, i sent an email. (Reply awaited). I think 750+gst isn’t justified for someone who doest pay many bills (or any other cashback 5% category). Does anyone had similar experience with StanC lately? I have this card. They charged 750+GST as joining fee for me. They also told me that I can get this card LTF, or you can get a cashback of INR 1500 on payment of the fees! I paid the fees and voila!, got the cashback after 9 months (as they promised). Now, coming to your question, the joining fee may not be reversed. However, you will not be charged renewal fee as you have crossed the 60k threshold.